I have a thing for thrillers & mysteries & creepy as f*** books, and McCreight is so on point it’s not even funny. As I read, I always try to solve the mystery myself (I’ll admit I’m not the best at it… but I’ve figured it out a few times!!) and while I’ll have a guess with her stories, even if I’m right there’s some crazy twist that makes everything so much more… insane. I love her writing, the way she builds the story and even though there are multiple voices… I know each one and understand their points of view. I wish she had more books for me to devour to be perfectly honest. She’s THAT good – and may have even stepped into Gillian Flynn’s spot as my favorite author. This particular story was riddled with heartbreak and stories of depression and overall, just really sad to see where the characters came from and what they’d all gone through. But because all of those sad, terrible things tied together this larger story… it made everything make sense and instead of dragging me down, it made me even more interested in getting to the bottom of everything. 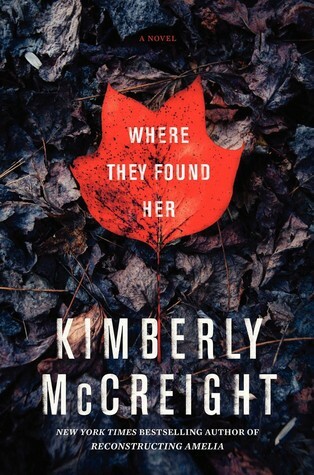 Some people may not like this because there are so many voices and so many storylines to follow along and piece together, but I really enjoyed it – the way McCreight wrote it helps you stay on the right track, so even if you’re iffy about that aspect, I still highly recommend picking it up. I gave Where They Found Her 5/5 stars on Goodreads, and I hope everyone who reads this, reads it!